Our son “Liam” is a very good eater and so far, he has no dislikes. He has started to showing a little preference in cooking method but so far, that is about it. He eats really well, and his pediatrician is very happy about that too. As you know, diet is the base of overall health. I try to feed him variety of food,variety of texture and tastes at this moment and, I am making his food nutrition in mind. I am hoping that he will continue to be a good eater even if he gets older. I was originally planning to share about solid food stories much later as he grown in my blog series. However, I have noticed that there is growing interests in how I feed Liam, what to feed, and when and more, I have decided to share about solid food story, baby food recipes etc.. a little earlier than planned. I hope that this solid food story series would encourage more moms to cook baby food using fresh ingredients and review what they are feeding to their babies/kids to provide a better meals for better health. I would like to help the babies to become a healthy good eater. I hope this series would help them achieve that. Liam’s very first solid food time Jan 25 2015..
Before you begin introducing solid food to your baby, there are a few things to note. 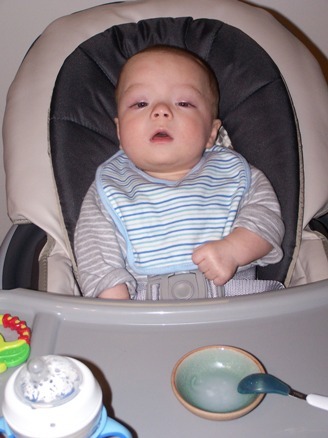 You would want to know about babies and food allergy. Food allergy is the reaction people get after eating food that is normally nontoxic food for human body. When a person with food allergy eats the specific food, the body take it as something toxic to own body and start reacting to it. According to my Japanese e-magazine, allergy rate is about 10% in babies, less than 5% in 3 year old and over. They say that typical symptom for the food allergy include nettle rash (hives), eczema, diarrhea, vomiting,runny nose, and cough. Many time, symptom would appear within 15 minutes after eating and almost all times, the symptom would appear within 1 hour from eating the food. 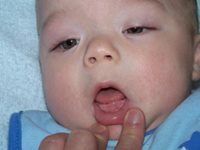 There are severe allergy reaction such as anaphylactic shock, breathing difficulty, continuous coughing or runny nose.When you experience these, the babies needs to go to hospital right away. When you start introducing something new in the babies solid food meal, make sure the following points. always make sure to give only about 1 tsp worth to start with just to see he/she is not allergy to the new food and watch out how they do after eating the new food especially next one hour from eating it in the menu. It is always good idea to introduce only 1 new food a day so you know what caused the reaction if any. Also, it is the good idea to introduce the new food when pediatrician clinic is open. Know the food that has potential to trigger the allergy in babies..
Food that tends to trigger allergy in babies are Eggs, Milk, and wheat. Among babies that were diagnosed as food allergy, 90% in less than a year old babies, 70% of babies aged between 1 to 3 are allergic to these 3 food items according to Japanese e-magazine. Not just when feeding those as individual item but also feeding food that contains those 3 allergy triggers, feed fresh and heat them thoroughly,and feed those from very tiny amount until you are sure your babies are not allergic to those. Back home in Japan, it seems when babies are diagnosed food allergy, pediatricians would ask the mom to feed menu that does not have any allergen they are allergic to. Then, as babies grow, the offended food will be re-introduced to the babies from tiny tiny amount. When you exclude everything anything that could contain offended allergen in menu, it is important to understand that the babies need to eat something that could be substituted nutritionally. When mothers removes everything that contains allergen and would not feed something in place to provide the nutrient that would be missing out, Japanese e-magazine says that it could trigger the developmental disorder. When your babies are diagnosed as food allergy, ask your pediatrician what you could use in place of offending food allergen nutritionally. When to start introducing solid food..
Back home in Japan, many moms start introducing solid food at about 5 months old age. Some may say that starting late from fear of allergy but, it has not been shown to prevent asthma, hay fever, eczema or food allergies. When you start solid food too late, you could encounter problems such as growth problems from nutrition deficiency such as iron deficiency because breast milk does not contains as much iron as cow milk does. When the babies is born, the first 6 months or so, breast milk would have good amount of iron in it; enough for babies to grow. However, iron amount would decrease gradually after the period. Not only that, practice of chewing,biting and swallowing the food gets delayed as well. When solid food is started too early, it would be hard for the babies’ stomach. Therefore, good age to start introducing the solid food is about 5-6 months old. It is about the time to practice to swallow while mouth is closed. Start the solid food adventure as you watch your babies development. Signs to look for to start the solid food adventure.. I have started Liam on solid food at about 6 months. It was simply because I wanted to know what I would be doing before jumping in the solid food adventure. He graduated from breast milk to cow milk at about a little over 1 year old. When you have fear for food allergy.. When you have fear of food allergy for babies, and if you feed the babies same thing, you will be feeding nutritionally unbalanced menu. It is a good idea to let the babies to explore variety of foods in texture, color, shape,and taste from the food list babies at the specific age could try. Exploration is the key to help the babies to develop taste buds to be a good eater. If you were not sure if you can feed the food in mind, ask your pediatrician and they would tell you if the food in the question is the appropriate food for the babies age. Babies does not have strong immune system against bacteria when starting out the solid food adventure. Digestive system (stomach) is not fully developed either. Therefore, you need to make sure the food is fresh, and it should be thoroughly heated. When heated, allergen that could trigger the food allergy changes, and it could make the food allergy hard to get triggered. 2. Pick the new food from list of food babies at the age can eat, and keep introducing the new food one a day so the babies get to explore variety of texture,taste, shape, color and learn to enjoy eating food. Also, it would naturally help you plan nutritionally balanced menu. With Liam’s case, personally, I give him new food 5 grams (about 1 tsp) for the very first time and usually I will feed him about 2 tsp worth for next 2 days.Then, on the 3rd day, I usually introduce another new food. I tend to introduce new carbohydrate (rice,noodle, potatoes,sweet potato etc), then new vitamin/mineral group food (vegetables), then new protein (fish,meat, egg, beans) and rotate. That way, I would not be introducing vegetables after vegetables.I rather wanted to widen the variety group by group. This is my own personal choice. 3. When you feed your baby something new, feed it when babies are healthy and not sick or not in good mood.Feed the new food when babies are happy mood.They will be more willing to try the food. Tips on starting solid food for babies..
For the new food to try, feed the new food single about 1 tsp and do not mix. Feeding single food would let the babies to learn the pure taste of the new food. Since Liam is older now, I can use seasoning and flavoring but even then, I feed the new food “as is” when introduced for the first time that include next 2 times that I feed. I would like him to learn the pure taste of the food first and then start enjoying weaker seasoning etc.. and enjoy variety of flavor from spices etc..later. Also, separating the new food to try is a good way for you to know if the new food causes babies any reaction to it. 4. Do not remove food with your own personal judgement but rather, if you have fear of allergy with the food in the question, ask the doctor if they can recommend any other food that could be substituted in placed of the food in the question nutritionally. Stay tuned for more on solid food adventure Japanese way..